It’s a fact and has been long documented. 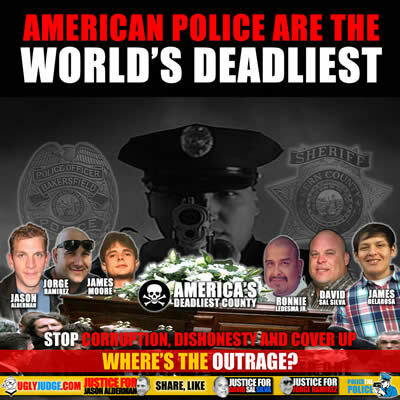 Perhaps the reason so many people are murdered by police each year is a result of whose hired? The job draws problematic people, people who seek power, respect, control and deadly force. Often bullies, losers, mentally unstable, insecure, sociopaths and psychopaths along with those who feel less than end up with a gun and badge to solve their problematic desires to be important. This comes at the cost of thousands of innocent lives, many deaths which are never accounted for and hidden from the public. The other part of the puzzle is how American courts treat killer cops. How judges, prosecutors, district attorneys and government who are generally in bed with police. When you have friends and co-workers who lack the capacity to be objective or fair there is no justice. You send a message to all police that because of your biased relationship with government “It’s OK to murder because we’ll back you up”. We’ll do all we can to make sure your life continues and you get to go home to your family. All the while thousands of families are destroyed, terrorized, ignored and kicked aside for speaking out. This is how a system based on greed and money treats tax payers.